My church hosts an annual Chili and Dessert cook-off each year in January. Picture 25 crock-pots lined up and enough sugar to lose a foot. 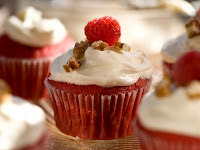 Red Velvet Cupcakes with Cream Cheese icing. Winner of the #1 dessert of 2008. I thought if I combined this accoladed recipe with my sassy mixer, then it was in the bag. 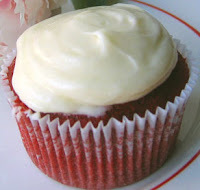 I continued to think this even as I placed those beautiful little sugar/flour/butter nuggets into my Cupcake Courier. Isn't she pretty? However, I had miscalculated the competition. Specifically, women over 65. This demographic is disproportionately represented in my faith family. This can be good when you want warm hugs and sweet smiles. But when you are headed to the starting line of a cooking competition? Umm...no. These are women who were raised cooking with one pot and a Bic lighter. Who used the sun to make tea and kept the pig as a pet until it was time for bacon. For me to even think I could have my pathetic cupcakes placed on the same table as their perfect pies and terrific trifles - was a battle with pride I was sure to lose.